Christopher Landon directs Jessica Rothe in HAPPY DEATH DAY 2U. Courtesy of Universal Pictures. To create a sequel just as clever, creative and entertaining as the first takes great skill and care. Luckily for us, writer-director Christopher Landon has done just that with HAPPY DEATH DAY 2U. This follow-up feature finds Tree Gelbman (Jessica Rothe) caught in a seemingly inescapable loop again, desperately needing to break out and start living in the future – not reliving the past. With an undeniably fun, lively energy and crafty, thrilling wit, the horror hybrid continues the legacy set by the original. At the film’s recent press day, I spoke with the affable filmmaker about everything from the production challenges they faced, to the Easter eggs eagle-eyed viewers might be able to spot, to the unexpected emotional charge this film contains. So much so, I embarrassingly was overcome with emotion attempting to get my question out. *** Spoiler warning *** If you want to go in completely clear, bookmark this page and return after you’ve seen the film, as our conversation is candid and contains spoilers. Proceed at your own risk. Did the navigating the challenges and difficulties with the first movie impact the way you approached the writing and filming of this? Yes. The first movie relied on repetition because of the time loop. So the second time around, I knew that I wanted to get through that aspect of the movie as quickly as possible. I didn’t think the audience would have the patience to go through that again. Creatively and practically, I didn’t want to go through that again. When I sat down to write this movie, I kept that in mind. Ultimately, once we get past some of the Ryan stuff, the only repeat things are the ones in Carter’s dorm room and a couple other spots. What was really fun about this movie was knowing that I could return to familiar to locations and scenes and approach them in a completely different way. That’s the virtue of being in an alternate dimension. There was something really freeing about that. I knew I could lean into people’s expectations of what they were about to see and then surprise them. Israel Broussard and Jessica Rothe in HAPPY DEATH DAY 2U. Courtesy of Universal Pictures. Was this sequel any more or less of a continuity nightmare for you and your team? Oh it was more. So much more. You should just ask our art department. They’d probably all throw rocks at me right now. It was very hard. It was really about having to match everything from the first movie. That goes from the practical locations to building the sets, to wardrobe. Even tracking down extras. We had to find people that were in key background and put them in the same clothes and make their hair look the same. I’m sure for the freeze-framers out there, they’re going to find all kinds of discrepancies, but we tried our best with the limitations we had. It was a very big challenge. We filmed a lot of the movie in the same hospital from the first film and when we went back to look at that location, they had gutted that hospital. We had to rebuild it. And we’re a low budget movie. It was really frustrating. But they did it, thank God. I was very lucky to have such a talented crew and they worked so hard to try and recreate the first movie. I loved that you took the opportunity to pepper in little Easter Eggs. That was our joy. That was our fun. At least we could deliberately change things. It was really cool to hide all that stuff. If people are watching them side by side, they’ll find a lot of cool things that have been flipped around. There’s a slight genre shift in this where it goes a little more sci-fi. Was there any sort of worry of having a more scientific explanation of how a loop happened versus it being a cosmic reason? I love how the dialogue mentioned that it’s no less meaningful for her. I wasn’t worried about it. I was more concerned with not repeating myself and making the same movie twice. I knew that by infusing this movie with a new genre element that it would also help keeping it more fresh. The explanation of how she’s trapped in this loop works because it provides us with a new story opportunity and it allows us to ask new questions and that is very important to me. We might sort of close one thing but we open another. That was essential for me. Was there ever a time where Tree didn’t slingshot back to her correct dimension and winds up in another different, alternate universe? We had conversations about that – that the end of the movie was going to be that. That we would trick the audience into thinking, “Oh she’s back and it’s normal.” And then hit the organ and “Oh my God! She’s somewhere else!” But for me, it stepped on what i was trying to say about the movie. Structurally speaking, there’s a very WIZARD OF OZ vibe to it all. She goes someplace else and is able to come back home. I wanted to preserve that as much as possible. 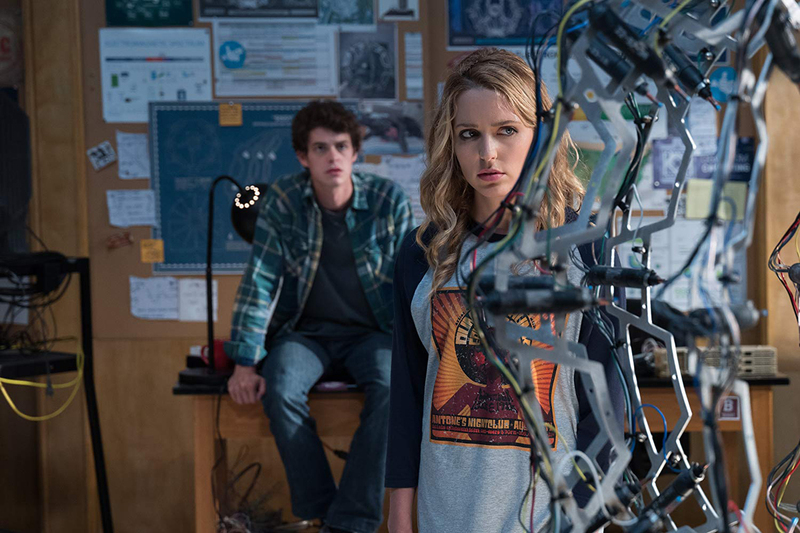 Jessica Rothe in HAPPY DEATH DAY 2U. Courtesy of Universal Pictures. You thread the needle in the first film with Tree’s grief over losing her mom. But here, you explore that further. When she’s at her birthday lunch and her mom walks in, I gasped. And…here’s where I start crying…. As a kid who’s suffered the loss of a parent, there’s no greater wish-fulfillment than that. It really touched me. Now you’re going to make me cry. You do it in a similar thematic way that ABOUT TIME does and with a similar profundity. Was it difficult to weave these personal things into the fabric? It wasn’t complicated – it was just very personal. For me, I lost my dad when I was 16 and it had a profound effect on me. And then my mom passed away three years ago. It’s difficult because I write and work in a genre where it’s typically frowned upon to get really personal and intimate and yet I felt really compelled here. I saw an opportunity to wrestle with this stuff and hopefully impart something I’ve learned from these really painful experiences, which is death happens and loss is a part of life. It’s about taking ownership of it and embracing the joy you had with those people and moving forward. This was a huge wish-fulfillment thing for me – the idea of being able to see someone again and say goodbye to them. It was really profound. Jess and I talked a lot about this stuff when we were preparing the movie. Jessica has a very close relationship with her mom. I knew this would affect her too and be very personal to her. I told her when we were rehearsing for this part, I said, “I really want you to take this scene and this moment to say these things to your mom because some day, you’ll go back and you’ll watch this movie and this stuff is going to have a really big impact on you. It was essential for me to tackle this stuff. I also wanted the emotional stakes of this movie to be so much greater than the first. So I felt enormous… I don’t know… it’s weird. I felt closure in getting to do this stuff. What;s most effective about it ultimately is it’s stuff that doesn’t traditionally exist in movies like this. I have to give credit to Jessica, who is an amazing actor and wonderful performer. And also Missy [­­­­­­­­­Yager], who plays her mom. By the way, that’s the even crazier story. When I made the first film, we never really had her mom cast in the movie. When I was in post-production, I realized I should have a video with Tree and her mom just so the audience can put a face to the loss. I called my casting director and asked if there was anyone we could find super quick and come over to my house to shoot a video on my iPhone. She sent Missy and, low and behold, that I was going to go back and make a second movie where she would have a huge role to play in this movie. I thought, “Oh my God. I hope she’s really good.” [laughs] Credit to my casting director, she sent me an angel – a wonderful actress who really understood this stuff. They had such a beautiful mother-daughter chemistry. For me, it’s the highlight of the movie. Everyone’s going to talk about the funny deaths and the action, or the scares, or jokes. For me, this will always be about the scenes with Tree and her mom. Obviously, as you can tell from my visceral reaction to it, you nailed it. It resonates. Well thank you. I really hoped I would do that. HAPPY DEATH DAY 2U opens on February 13.